Our Junior Leadership Team is set up to allow the children here at Yarmouth to have a say in running their own school. This allows children to have a greater sense of belonging, become more confident when putting their ideas forward and develop a greater understanding of the need to work co-operatively for the good of others and the community. 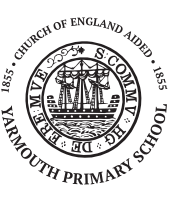 The Junior Leadership Team (JLT) at Yarmouth take part in the interview process for prospective staff and provided a ‘face for the school’ to show visitors around and talk about the different areas in school. We have regular meetings to discuss the ideas of the children and look at what changes the children would like in school. We look to extend and develop the federation links further as this is something that all the children have enjoyed. The JLT work on the school behaviour policy as part of the consultation process. They discuss thoroughly all aspects of the child speak section. We meet with Shalfleet Junior leadership team to discuss the role they have across the federation and any events that we can work on together.